One ecologist’s plan to plant milkweed to save the popular pollinating butterfly. Ten years ago, a grain farmer in Northeast Nebraska wrote me a letter: “I am concerned that the recent large use of Roundup-ready crops (which I use) and the subsequent widespread use of Roundup herbicide (which I also use), have led to the virtual elimination of milkweed in fields and crops,” he said. But it wasn’t the loss of milkweed that alarmed him most; it was the fact that with its disappearance, the monarch butterfly had also left his farm. I’m an insect ecologist, and I’ve spent much of my career working with pollinators — a keystone group of organisms that help maintain the fabric of our ecosystems. They provide the services that yield the berries, fruits, seeds, foliage and roots that are food for hundreds of thousands of species worldwide. Seventy percent of native vegetation requires pollination, as does thirty percent of our food supply. Reading that farmer’s letter was a devastating signal that monarchs were at serious risk. More importantly, if we lose monarchs we lose a large number of other species that feed on pollinated plants. I founded Monarch Watch in 1992 at the University of Kansas. We started a small monarch tagging program that year with two news releases asking for volunteers; the response was overwhelming. Two things were clear: the public’s interest in the monarch is tremendous, and citizens want to contribute to science. Each year, thousands of volunteers tag monarchs from mid-August through early November as the butterflies progressively move in a southwesterly direction toward Mexico. Yet sightings of migrating monarchs have become increasingly rare. By the time the Nebraska farmer’s letter arrived, it was already clear that monarchs were nearing a crisis point. Their population has dropped 90% since the 1990s, and the focus of Monarch Watch has switched from education to an all-hands-on-deck recovery plan to save the monarch migration. People are digging in — literally – to plant milkweeds and nectar plants for these butterflies. Like other threatened species, the monarch’s main challenge is habitat loss. Except in this case that habitat isn’t the wilds of the rainforest, but a group of plants known as milkweeds, native to America’s grasslands. Monarchs lay their eggs only on milkweeds, and the developing larvae feed exclusively on these plants. One of the milkweed species, the common milkweed, invades croplands where it survives in modest numbers in spite of mechanical tillage and some chemical weed control. Through the 1990s the farms of the American Midwest were an Eden of food and protection for monarchs, with ample milkweed plants springing up within crop rows. That all changed with the introduction and rapid adoption by farmers of herbicide tolerant (HT) corn and soybeans. These HT crops are sprayed with Roundup (glyphosate) eliminating annual weeds and eventually perennial milkweeds from fields. Farmers started to grow HT crops in huge numbers in 2000. Common milkweed had never been particularly abundant in crop fields— other species were far more problematic for farmers — but Round-Up didn’t spare the plant just because butterflies liked it. As common milkweed died out, monarchs began to decline. In 2007, Congress passed the Clean Energy Act, a.k.a. the Ethanol Mandate, and the demand for corn spiked to an all-time high. With one piece of legislation, the situation went from bad to worse for monarchs. Farmers pulled land out of conservation and planted any acreage they could find in corn — Round-up Ready corn. Grasslands — including some of the last remaining native prairies, rangelands, wetlands and 11.2 million acres of Conservation Reserve Program land, much of which contained milkweeds — were converted to crops. Since 1996, an additional 29.5 million acres of land have been put into corn and soybean production, almost all of them devoid of milkweed and the butterflies who rely upon it. Monarch Watch is now on a mission to revive milkweed habitat. We’ve established over 7,700 “Monarch Waystations” or milkweed oases throughout the United States and eastern Canada. And, this year, through our “Bring Back The Monarchs” program, we are in the process of distributing over 40,000 milkweed plugs (small plants) to home gardens, schools, and nature centers. Each garden, backyard, roadside edge, pasture and piece of grassland with a milkweed plant is a haven for monarchs, other pollinators and the plants and animals that depend on pollination. The monarch butterfly’s decline is a bellwether of a much larger crisis facing all pollinators. I hope that by winning the NRDC and BFI Growing Green Pollinator Protector Award, I can remind people that the pollinators on our farms and in our gardens are as fundamental to the health of our ecosystems as they are fascinating and beautiful. Monarch Watch is built on the idea that all of us acting together can be a powerful force for good. If we move quickly, we can save one of nature’s most spectacular migrations. By planting milkweeds and other nectar rich flowers, we can throw a lifeline to monarchs and their fellow pollinators. So look for a patch of dirt in your backyard. 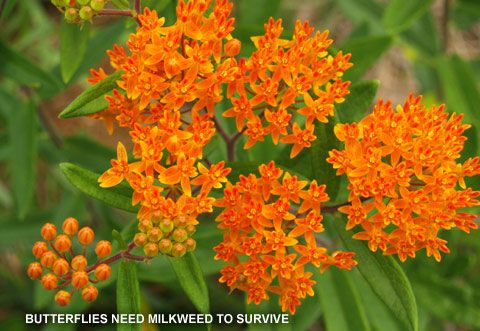 Start a milkweed project at a school, church or nature center. Give out milkweed seeds as gifts to your friends. Spur the demand for food that’s pesticide free and pollinator friendly. And support the organizations that speak for monarchs, pollinators and the habitats they share with other species. It’s all connected, and if we maintain those connections and reconnect those that are broken, we can bring the monarchs back. This guest post is by one of the four winners of NRDC’s sixth annual Growing Green Awards, which celebrate the farmers, business owners, and bold thinkers who are making America’s food system healthier and more sustainable. See all of the posts from this year’s winners here. This entry was posted in News and tagged Butterflies, Chip Taylor, Milkweed, monarch butterflies, monarch watch, monarchs, NRDC. Bookmark the permalink. Follow any comments here with the RSS feed for this post. Post a comment or leave a trackback: Trackback URL.